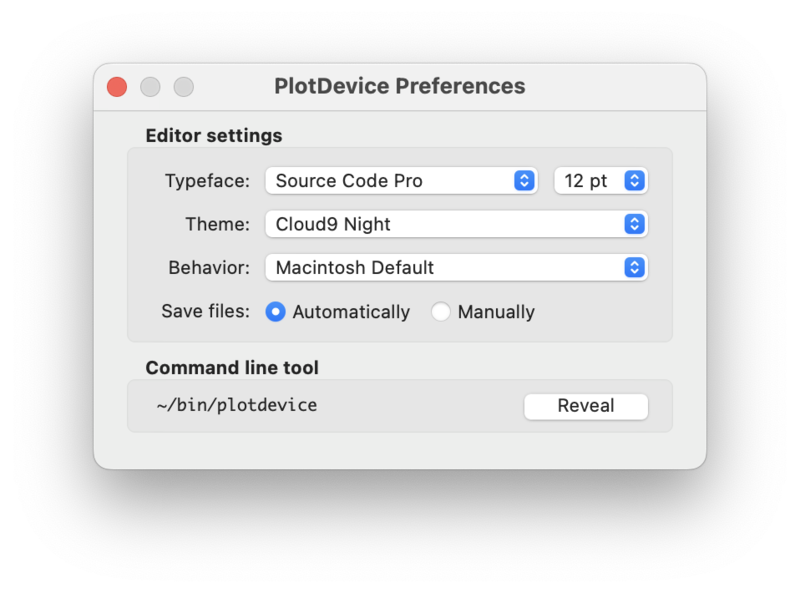 The PlotDevice application is a convenient environment for writing scripts and being able to quickly see how your edits affect the graphical output. But once you’re happy with the state of a script, you can start to treat it as a program in its own right (rather than a mere ‘document’ that only exists inside the app). The graphics core used by the application is also available in a ‘console’ setting, allowing you to run your scripts from the command line. It can even be used as a traditional Python module that you import into your own programs. The scripts you write in PlotDevice can be run from the terminal using an external command line tool called plotdevice. The command allows you to run scripts, coordinate with an external editor, and export images, movies, or animated GIFs. Select a destination folder in your shell’s PATH and the application will create a symlink from there to the script contained in the app bundle. If admin privileges are required to access the selected folder, you will be prompted for your password. Note that since this connection involves a symlink, the plotdevice command will break if you move the application after installing the tool. If this happens, you will see an error message in the Preferences window and can reinstall the link using the same procedure as before. As in the PlotDevice application, you can use ⌘R and ⌘. to re-run and interrupt the script. The Export menu items are also available to you. Running the command with just a filename argument will display its output in a window, but with the right combination of command line switches you can export graphics to file using any of the supported image/video formats. But fear not; we’ll walk through each of the options below. Though the plotdevice command provides a convenient way to launch scripts with the PlotDevice interpreter, you may prefer to use the graphics context and export functions from within your own module (and running whichever python binary your system or virtualenv provides). Though using ‘import *’ is generally frowned upon in the Python community, we feel like it’s pretty easily justified in this case since PlotDevice’s raison d’être is to make your drawing code short-and-sweet. But if you plan to do more than generate a one-off, you’ll likely find the with export() usage more convenient. The context-manager provides some handy methods for writing images, multi-page PDFs, and even animations. As you can see from the toy example above, Python scripts that use the plotdeivce module look a little different from scripts that run in the PlotDevice application. In particular, the lines at the very beginning of the Python script aren’t necessary in the application since it provides all the graphics commands implicitly as part of the script’s runtime environment. 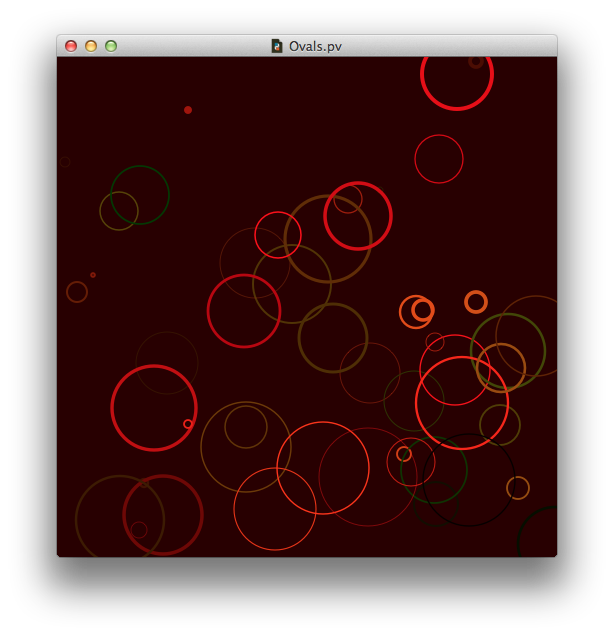 In addition, scripts that run in the app or with the plotdevice command expect special handling relating to animations. Just by defining a draw() method in your script, the viewer will repeatedly clear the canvas and call your method – even though the script itself doesn’t explicity call it. It’s for this reason that the scripts you save from the application end with a .pv extension rather than a .py. The file extension is a small reminder that there are some missing pieces required to turn the file into full-fledged Python script. Importing the module won’t give you the default animation behavior (though you can easily create movies with the export() command), but it will add all the familiar PlotDevice commands to the script’s namespace. In addition, it will load all the necessary C-extensions and other system dependencies.